I have been a member of Twitter for nearly a year. My tweet output may have dropped off in recent months but that doesn’t mean I am using the service any less. I think I am more connected to Twitter than I was when I started. I like to think I have a healthy variety of technology, news, friends, locals and people that I have a common interest with on my Follow list but that doesn’t give me the full story. I follow any discussions marked with the Edmonton “#yeg” hashtag and routinely go into Trends to see what is making news on Twitter. I am often informed of news from Twitter before it comes up on my RSS reader. However keeping tabs on all of that at once can be trying and I have recently become addicted to Twitter desktop applications. I have tried several clients and will talk about them below. Notably missing from this list is Twhirl. I have used it but it was no comparison to my favorite application and removed it immediately and I could not be bothered to install it again for screenshots. Seesmic Desktop launched in April to a lot of praise and publicity on Twitter. It had an immediate market share penetration. I could no longer hide from it so I tried it out to see what all of the fuss was about. The application is straightforward and fairly robust. It wasn’t what it did that caught my attention, it was what it didn’t. I immediately noticed I could not filter columns (from my timeline or searches) and this is something I have come to rely heavily on. Since this program is still in its infant stages I may be persuaded to return to it once they improve some of their features. 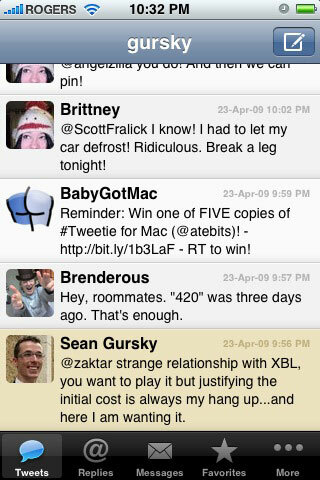 The popular iPhone application Tweetie now has a Mac desktop application. On the surface it is very simple and clean, and if I primarily used a Mac at work I may consider switching over to it full time. Still, it is my primary application on MacBook Pro because I like to keep tabs on my timeline but do not require the extensive functionality of other applications. For long term usage I would like to have saved searches that I find useful when I have a Twitter application open for 9-10 hours a day. 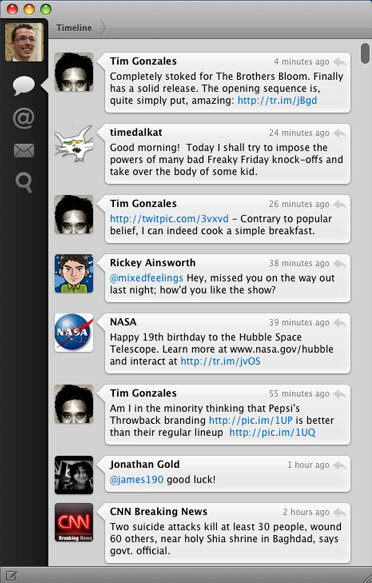 I have not investigated what the full version of Tweetie is capable of, but it would have to be really impressive to persuade me from the free version of Tweetdeck. I have saved the best for last with Tweetdeck. There really was no competition here, Tweetdeck may occupy more memory than I would like but it has changed the way I get information on Twitter forever. At first I was overwhelmed with this application but it is now clearly my favorite. It can do everything previous clients can but also has Facebook integration for status updates, TwitScoop, multiple URL shortening services available (compared to others applications that would have just a few) and the ability to filter results in a column. This is something I recently discovered and it has cleaned up duplicate data between my main timeline and my “#yeg” column. My primary Tweetdeck view gives me everything I need to know immediately and it fits perfectly in the corner of my monitor and requires no switching between tabs or scrolling to see more. The program is not without its shortcomings, such as not being able to save filters on a column and its demand on system resources. However those are small grievances to an otherwise robust and great program. 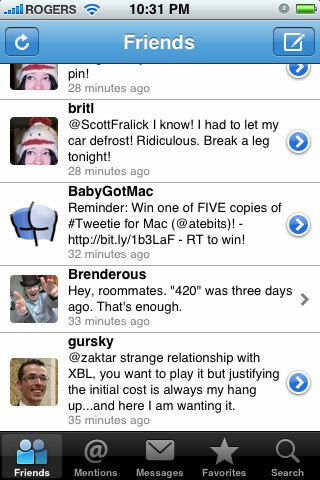 When I am not in front of a computer I rely on my iPhone to keep me up to date with Twitter and there are just as many applications for that as there are for desktop use. It seems applications for Twitter are a dime a dozen but one notable application missing from this list is Twitterific. I tried the free version, liked it, but it had nothing to keep me coming back and I could not justify the $9.99 price point of the full version. 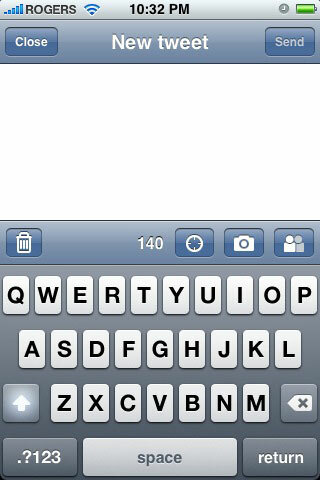 Unlike the desktop programs I do not have a clear favorite for iPhone applications. This is a tale of two clients: Tweetie vs. Twitterfon. When comparing the differences between Tweetie and Twitterfon I was hard pressed to offer a compelling argument. I found Twitterfon to be as capable as the pay program of Tweetie. 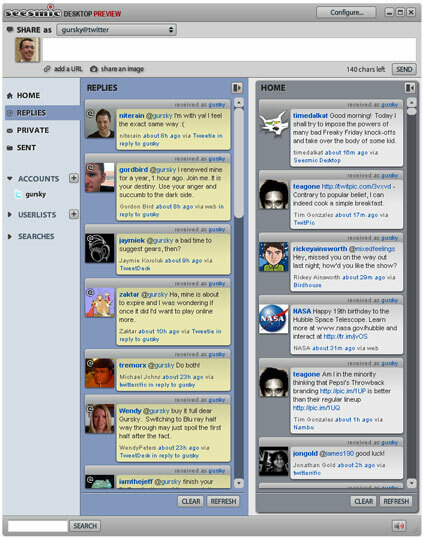 They provide the same information such as Trends, GPS capabilities and images are uploaded to TwitPic. There is only so much you can include an a mobile application before it becomes difficult to use and the features they do have are perfect. 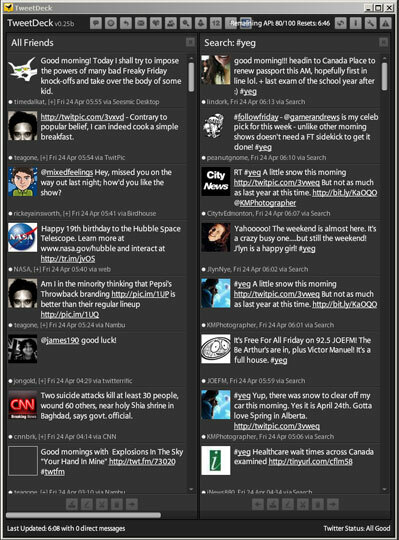 Comparing the Tweetie interface to the Twitterfon interface reveals they are nearly identical. 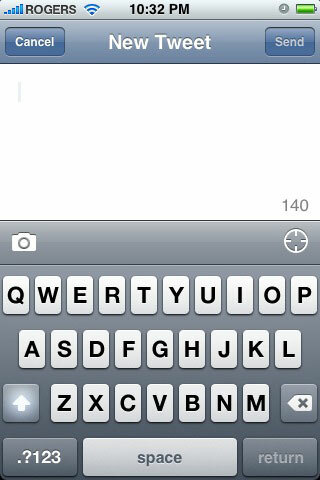 Even the Tweetie new message and Twitterfon new message are similar. I will concede that Twitterfon did something I loved with the “person” icon when you make a new tweet. That will show your entire follow list and you can select who you want to direct the message to, which saves embarrassing tweets because you spelt someone’s name incorrectly. If they are nearly the same application then why would I pay $2.99 for Tweetie? I was able to justify it because of the subtle differences like speed at which the application loads my timeline, it doesn’t have hideous colors for unread tweets on my main timeline and replies, the ability to save searches and finally I thought the developer at least deserved that much for their work on the iPhone and Mac client. It seems excessive to have two Twitter applications on my iPhone but that’s how even these two programs are. Let’s see: hug a tree – check, beard – check(ish), Volkswagen – check: you really are that guy from the commercial! I really want to *GET* a more robust mobile twitter app. I have no intention of becoming a application for the iPod. Blasted comments not allowing HTML. I don’t know what it is you were trying to do, and apparently the commenting system on WordPress didn’t know either and now your Cornify attempt looks like a mess.